Selected the “BEST BRUNCH IN BAKERSFIELD” for 22 consecutive years. Featuring made-to-order omelets, scrambled eggs with country ham, bacon and sausage. 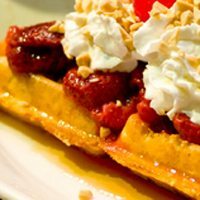 Try our Belgian waffle bar, assorted bakery muffins, homemade pasta, ranch style enchiladas, tri-tip, fresh fruits and assorted salad bar, and of course our famous dessert and Ice Cream Shoppe.